Maintaining a lush green lawn is a challenge in the desert. According to the University of Nevada, the Las Vegas area receives less than 4 inches of rainfall yearly and has an evaporation rate of 80 inches of moisture a year. In addition, temperature extremes in the desert range from very hot in the day to below freezing at night. But it is possible to maintain a green lawn. The key is to select drought-tolerant sod varieties and to properly irrigate the grass. Break up your soil with a rototiller by passing the rototiller over the soil twice. Your second pass with the rototiller should follow a perpendicular line to your first pass. Spread compost over the surface of the soil and mix it into the soil by passing the rototiller over it again. Install the irrigation pipes into your lawn by assembling the pipe and digging trenches for it. Place the pipe into the trenches and then grade your lawn with a rake around the irrigation pipes. A drip irrigation system is best for a desert climate, because it waters the roots of the grass with less evaporation than a sprinkler system. Rake the soil until it is level to grade it. Remove any large rocks that you find as you do so. Select a summer grass sod such as Bermuda grass. Summer grass can withstand the daytime heat of the desert better than winter grass. Lay the sod over the soil like a carpet. Start at a straight edge like a road and work slowly toward the other end of your yard. Stagger sod pieces so that there is not a uniform seam between the sod mat. Cut longer pieces and odd shapes so that they fit over the dirt perfectly. Make clean, straight cuts and curl the cut edges under slightly. Roll over the sod in two different directions with a sod roller to force the roots of the grass in contact with the soil. Water the sod 3 to 4 times daily for short intervals to keep the grass moist and allow it to take root. Do not water at night, or for long intervals. Continue this for 10 to 14 days, then reduce watering to once per day for a longer period of time. 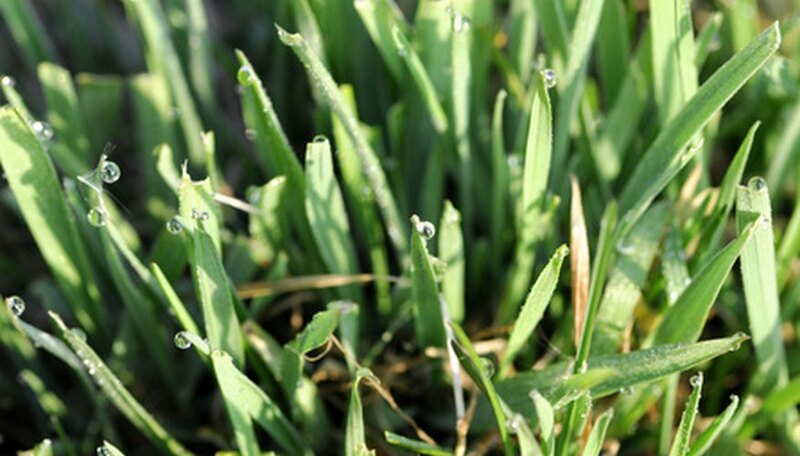 As the grass takes root, decrease the watering to once every 3 to 4 days.